Today I'm combining Apartment 528 Reads and Weekend DIY into one. Turf is the best DIY book I've read. Anthony Garay's writing is witty and funny and his directions are easy to follow. Made for 20-somethings on a budget, it won't cost you much to make the projects in Turf. Not only are they affordable, but all of the furniture can be built with just a jigsaw and power drill. Of course, if you're looking for something more than the basic plywood pieces shown in Turf, don't worry. 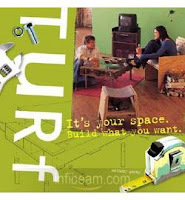 With paint, fabric, and a few extra tools, you can customize to your heart's desire using Turf as your launching point. The book is full of projects for every room including a headboard, a microwave cart, a chair for the living room, and a filing cart to keep you organized. I plan on making the nightstands for myself!